To measure a western gorilla in its habitat without "invading their privacy", is not the easiest of tasks. 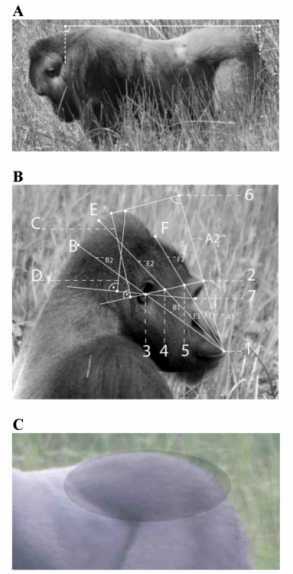 Using a novel photometric technique, the Max Planck Institute have been able to assess reproductive success in the male gorilla according to his physical (phenotypic) characteristics. Thomas Breuer, who also worked for the Congolese Wildlife Conservation society, and his three colleagues from the Institute carried out the fieldwork in a Mbeli Bai forest clearing using telescopes on a high platform. From 1995 to 2007 is not a long-term study in terms of gorilla life-span, but considering political conditions and communications in the Republic of Congo, the researchers are to be commended for staying at their posts (except for a few fraught months). Female reproductive success seems to influence the gorilla's success much less than the dominant males contributions, so Dr Breuer and his colleagues largely took account of offspring survival and the rate of siring offspring simply up to weaning. Average number of females per male was the first-used measureable quantity. Body mass would have been a useful guide but wasn't used in this study. Instead, body length provided a useful link and gluteal muscle size and crest size were also measured photometrically. As gorillas visit the clearing only twice a month, birth, death and dispersal rates could be estimated. Births seem to have been easiest, with adulthood presumed at 10 and 18 years respectively for females and males. Death was taken as a midpoint between last observation and the next time the group were seen without the individual. Only one or two infants may have been missed because of the time lapse between gorilla visits. 19 silverbacks were studied over the twelve year period, with an average of just under 9 years per animal. The females per male were an average of 2.4 for 16 of the silverbacks, with the record held by one guy with 11 "wives." The young survived at a rate of between 0% to 80%, with from 0 to 1.3 of the offspring surviving to weaning each year. All of these measures of success were highly correlated with each other. For the gluteus size or crest size measurement, the larger they were, the more the breeding success. There were more females with these males and they had better survival rates for their young. Smart ladies! As far as long bodies were concerned, they only had significantly more females, not greater siring or survival rates for their young. Male-male competition in gorillas then seems to align with that in other mammals. In particular the gluteals function as speed merchants, increasing acceleration, manoeuvrability and natural strength. Confrontations often involve lunging, chasing and the awful fight scenes that require such muscles. Females get the same coercive display, without the full aggression, indicating how sexual selection is in play. Defence of the offspring of course would be another major selective influence. The first line of defence for the group is the lone silverback, without whom the group would break up. One of the most interesting findings was that the males with higher siring rate lived longer, showing they must have continued into old age without necessarily losing any status, or possibly even their strength. Perhaps the length of time they can stand the pressures of just being, "the number one" is a measure of their fitness. As these physical traits are heritable, then the dimorphism of primates is being extended in this species. Ongoing selection seems to be healthily progressing in terms of silverback male characteristics. Dr Breuer et al publish, Phenotypic correlates of male reproductive success in western gorillas, in the Journal of Human Evolution (2012), doi:10.1016/j.jhevol.2012.01.006.